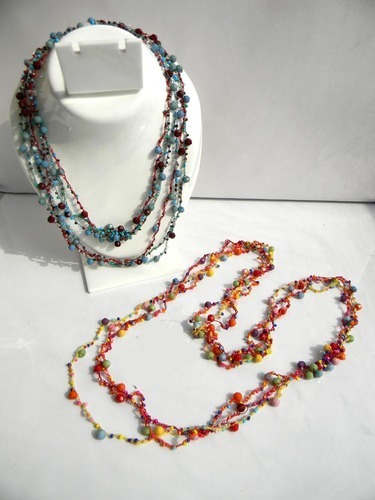 Clients can also avail from us our range of Designer Necklace which we supply, distribute and export in wide range. Our designer necklaces we are offering are beautiful and finely crafted accessories ideal for special occasions and events. These designer necklaces have stunning designs that are meticulously crafted and designed by our highly skilled personnel. These designer necklaces are very stylish, skin friendly and easy to use. Clients can avail from us our range of designer necklaces at market leading range of prices. With substantial industrial experience of more than 20 years, we have emerged as one of the prominent distributor, supplier and exporter of artistically crafted artificial jewellery. Our extensive product range includes Imitation Rings, Imitation Necklace, Imitation Ear Rings, Imitation Bangles, Imitation Jewellery, Handicraft Jewellery And Imitation Bracelets, We are looking queries from U.S, U.S.A & Canada. Due to their unique charm and beautiful design, our products have carved an eminent position in the market. These products are procured from the reliable market vendors who make use of high grade raw material, which is skin friendly and durable. Our capacious infrastructure offers large storage as well as packaging space and is operational with modern machines and number of tools and equipment. Our potent workforce efficiently utilizes ultramodern machines to cautiously check these products during procurement and in making timely deliveries to the clients.